You know when you purchase an item on sale and it becomes your most favorite piece of clothing? This skirt is that item! I got it about a year and a half back from Piperlime (right before it shut down it's doors) and I have worn it so many times since then. Four time on the blog already (recent). Cobalt blue is one of my favorite shades of blue and I personally feel it is so versatile too. It can be paired with neutrals as well as most bright colors alike. Looking forward to styling it at least a hundred times more. 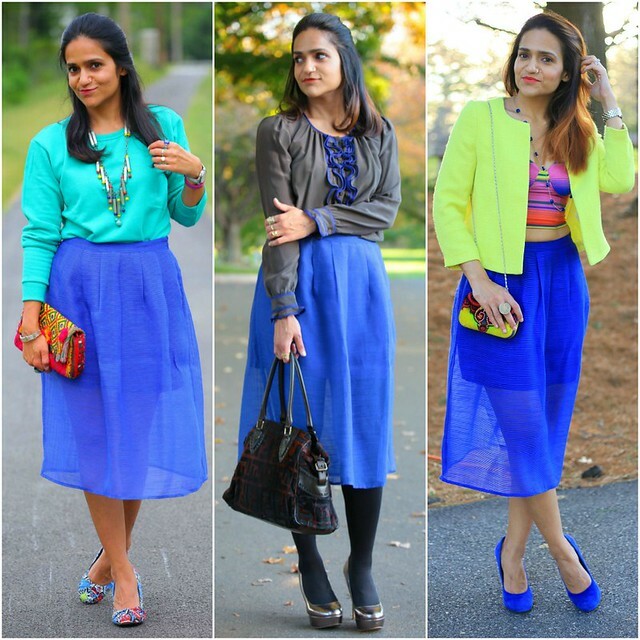 I can see why you like the skirt so much and the color is totally gorgeous! BEAUtiful combinations with that skirt! Each one! Beautiful skirt! I like the third option for summer festivals. a year and a half ago and you still make it work. I love the 3 looks, can't decide what I like the most. Also love the clutches on the 1st and 3rd pic.